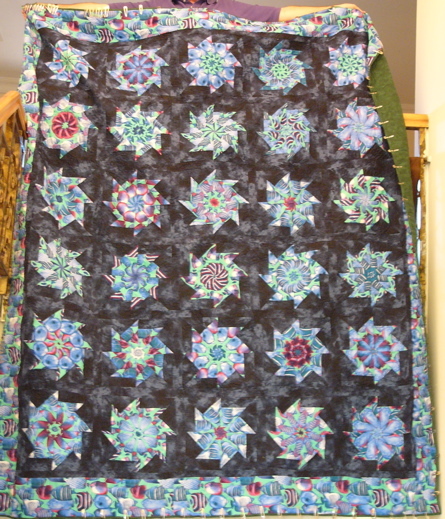 This turned out to be one of my very favorite quilts. My challenge to myself was to find everything I needed for the quilt in Doha, Qatar. I found a wonderful shop, Anwar al Doha, which means The Lights of Doha, and there was the fish fabric and the mottled navy background fabric. Each block was so fantastic! I love this quilt! I was using it to teach a class on Stack and Whack. Oh, did we have fun. Stack and Whack is a technique pioneered by Bethany Reynolds. You need wild fabrics, with a lot of variety in the background, to make them, but they give great immediate gratification to beginning quilters, and you can hide a multitude of mistakes in their bright and whacky design. This entry was posted in 2005, al Fardan, Attributed, Doha, Machine pieced, Machine quilting, Stack and Whack. I have several american quilts from different eras that I aqquired out of a family estate. I am looking for someone to help me determine what patterns and values they have. I live in Doha, Qatar but could send digital photos to anyone who can help. Karen, there is a group, the Qatar Quilters, who can get you started. They meet at Al Jazi, I believe, at least once a month, and have other workshops, too. 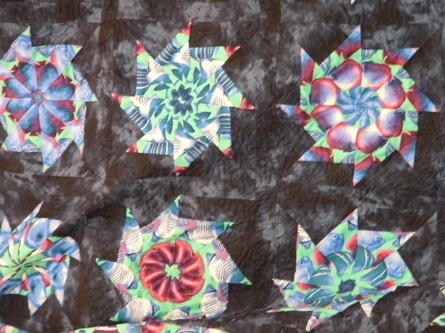 Lucky, lucky YOU to have inherited quilts! What a treasure!